A unique chocolate made to look like a beetle larva has captured the fancy of candy aficionados in Japan. Produced by the Komatsuya confectionery and bakery based in Akita prefecture, the bite-sized Larva Chocolates (Youchu Choco) have a grub-shaped body made from milk chocolate and corn flakes, a layer of skin made from white chocolate, legs made from tiny strips of dried squid, and a dainty mouth made from orange peel. Komatsuya, which is struggling to keep up with demand, hand-produces about 400 per day and sells them online (shipping in Japan only) for 210 yen ($2) each. 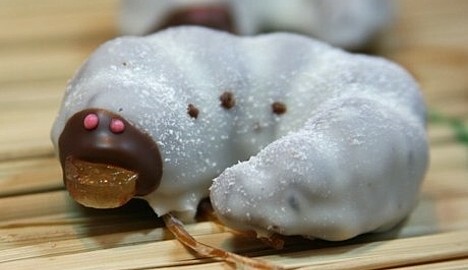 The company also offers up the repulsive-yet-cute candy grubs at product fairs, where they tend to get snapped up in a hurry. Larva Chocolates are now available in Tokyo at the Chocolate and Sweets Expo, which is being held at Sunshine City (Ikebukuro) until March 9. Looks like I'm going to Ikebukuro tomorrow. Yum yum! :9 And they're so cute!! Site owner, please delete the postings which begin and end with [...] - these are spam from a pay service which seeks to inflate their customers' Google rank by 'linking' to you. They are not comments but echoes. yummy yummy this looks so awesumness!!!!! =) weird but totally Awesome! ??????????? | my7475???? ?? ?? ?? Beetle larva chocolates | Free Article Database!- Free Updating! Larva de chocolate | Naba Pura!